Contemporary British Art has its roots in centuries of painting and Sculpture created for church, state and those wealthy enough to commission art . One of the greatest changes in British art in this century is that it has become more accessible to private art collectors and enthusiasts. In the 18th century, the English school of painting was mainly noted for Portrait paintings and Landscape paintings . Among the British artists of this period are Sir Joshua Reynolds, George Stubbs and Thomas Gainsborough. William Hogarth painted down to earth portraits and satires. Hogarth's humour and social realism have influenced many contemporary British artists and political satirists. He was also the first great English printmaker. Red Rag artists with art works as Limited Edition Prints include: Richard Adams, Quentin Blake, Mary Fedden, Peter Heard and John Knapp Fisher. The late 18th century and the early 19th century was perhaps the most radical period in British art, producing William Blake, John Constable and Joseph Turner. The most internationally influential of all British artists Turner was noted for his wild, almost abstract, landscapes that explored the effects of light. He was a profound influence on the later impressionists and many contemporary landscape artists. At the Red Rag Gallery these include artists such as Matthew Draper, Judith Gardner, Steve Outram and Kate Van Suddese . The Pre-Raphaelite Brotherhood achieved considerable influence after its foundation in 1848, with paintings that concentrated on religious and literary subjects executed in a detailed style. Artists included John Everett Millais, Dante Gabriel Rossetti and Edward Burne-Jones. Also associated was designer William Morris, who advocated a return to hand-craftsmanship in the decorative arts over industrial manufacture instigating the Arts and Crafts movement. Alfred Sisley was British, but painted in France as one of the Impressionists. Walter Sickert and the Camden Town Group developed an English style of Impressionism and Post-Impressionism with a strong strand of social documentary. The revolution in western art that started in the late nineteenth and early twentieth century with the Impressionists caused a dramatic sea change in the way people viewed art and the world around them. 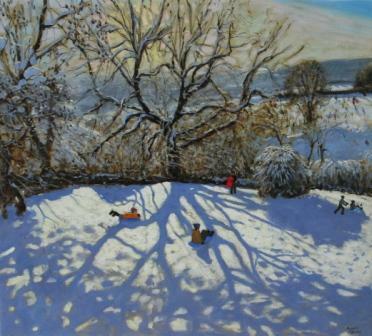 Red Rag Gallery artists influenced by Sisley and Sickert's style include Stephen Brown, Simon Davis and Mark Preston. Vorticism was an important British modern art movement at the beginning of the 20th century, whose members included Sir Jacob Epstein, Wyndham Lewis and David Bomberg. Around the same time Stanley Spencer painted mystical works, as well as landscapes. Surrealism was briefly popular in the 1930s, influencing Roland Penrose and Henry Moore. Throughout the twentieth century artists continued to push boundaries and experiment. British contemporary art was born and has flourished. The art we now think of as British contemporary art is generally accepted to have been produced since the second world war. Henry Moore emerged after World War II as Britain's leading artist, promoted alongside Victor Pasmore and Barbara Hepworth at the Festival of Britain. Abstract art became prominent during the 1950s with Ben Nicholson, Terry Frost, Peter Lanyon and Patrick Heron, who were part of the St Ives School in Cornwall. Many contemporary British artists are still influenced by Cornwall and its dramatic landscapes and Marine paintings of seascapes. At the Red Rag Gallery these include Peter Beeson, Martin Leman and John Piper. Lucian Freud, Frank Auerbach, John Tunnard and Francis Bacon ("The London School") were contemporary figurative artists who influenced many other British artists. As a reaction to abstract expressionism, pop art emerged originally in England at the end of the 1950s with the exhibition This Is Tomorrow, David Hockney, Peter Blake and Richard Hamilton were part of the sixties art scene. In recent years The Young British Artists movement, which includes Damien Hirst and Tracey Emin, has risen to prominence and achieved international recognition with their version of conceptual art, which often features installations. The Tate gallery and its Turner Prize, as well as the Royal Academy have featured their work. In 1999, the Stuckists figurative painting group was founded in opposition to the YBAs. The Federation of British Artists hosts shows of traditional figurative painting. British Art has become both newsworthy and more accessible. Artists Jack Vettriano and Beryl Cook have established widespread popularity. Banksy who made a reputation with street graffiti is now a highly-valued mainstream artist. The UK contemporary art market has enjoyed a spectacular resurgence in recent years and popularity of exhibitions of contemporary art has soared. Many regional British Art Galleries , such as Red Rag Gallery, have opened and achieved success due to the increased interest and knowledge of an art-loving public. British contemporary paintings and sculpture have become increasingly accessible both to view and to own.